It is a feature of academy life at Liverpool, the doors of the Ian Frodsham indoor hall swinging open at 7.0am when the youth coaches pile in for a game of five-a-side before training starts a few hours later. 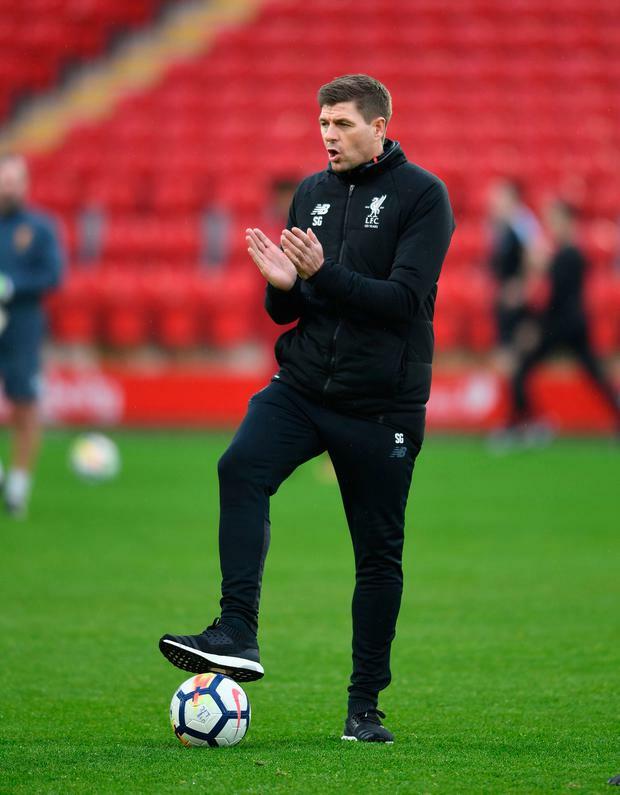 Regularly, Steven Gerrard is there – along with Tom Culshaw and Jordan Milsom, the assistant and fitness guru who will go with him to Glasgow Rangers. It is quite a scene to imagine, the one where Gerrard, Liverpool’s greatest modern footballer, asks quietly whether it’s OK if he can join the routine, as he did last summer. But that is what happened. The story shows the side of Gerrard you either don’t see or prefer not to recognise. It shows he does not think he is too big or too important to do anything; to get his hands dirty and muck in. It shows youngsters as well the sort of appetite you need to be where he is, an appetite that still serves you even with a 38th birthday approaching. Gerrard is not a throw-back coach who inserts himself into training sessions with active players in the same way that Bob Paisley or Reuben Bennett did but the competitive bug has not abandoned him. This partly explains why he is now heading to Scotland. Liverpool’s U-18 team would probably have won the league this season had Gerrard’s guidance not hastened the development of individuals under his watch. Five or six of Liverpool’s academy players have kicked on unexpectedly. “I’m not sure whether this would have happened naturally,” said one person, who follows academy football closely. Two of them are Adam Lewis, the left-back, and Curtis Jones, the attacking midfielder. The sight of Jones amongst the celebrations in Rome on Wednesday night is a mark of Gerrard’s work. Though other coaches have helped along the way and ultimately, it is Jurgen Klopp who makes all of the decisions about selection at first-team level, Jones has elevated from the U-16s to being tracksuited for a Champions League semi-final in fewer than 12 months. It has been the player’s improved maturity that has impressed most. Jones is now 17 years old and though he comes from the nameless district closest to the city centre next to where Park Lane meets Jamaica Street, he had once strutted around telling anyone who would listen that he was, in fact, an Arsenal fan. Gerrard has helped make him understand what it means to not only play for Liverpool and how supporting them increases wanting and desire. Jones was selected by Klopp on the bench for the Merseyside derby last month and there is as much hope inside the club that he can eventually follow the same path as Trent Alexander-Arnold. “Trent is going to be a beauty,” Gerrard said 12 months ago last week, as he contemplated his own coaching future in one of Anfield’s main stand executive suits. He knows a player when he sees one. It surely should encourage youngsters in the Rangers academy – and their U-18s defeated Celtic last weekend – that Gerrard appreciates how much hard work goes on at junior levels in the modern game. Gerrard’s appointment at Liverpool last summer had invited questions relating to his approach. Would he learn and observe first? He did not stand back, though. Straight away, he was planning training sessions and taking them, spending hours watching games back, picking out where both he and those players could improve. His days were filled with football, as they always have been, but his role was a serious one and his commitment absolute, even with media roles at BT Sport. Gerrard has worked under the following managers at first-team level: Gérard Houllier, Rafael Benítez, Roy Hodgson, Brendan Rodgers, Kevin Keegan, Sven-Göran Eriksson, Steve McClaren and Fabio Capello. It is fair to say, Gerrard’s performances under Benítez defined his legacy. Even though the relationship was a loveless one, if you listen to Gerrard he does share the basic Benítezian belief that character in a player is more relevant than ability. As a young player especially, Gerrard could not relate to team-mates whose commitment did not match his. In one of his earliest training sessions, he targeted Paul Ince, the Liverpool captain and in his own words, “wiped him out” with a ferocious tackle. Nobody was getting in the way of this train arriving from Huyton. Initially as an academy coach, it frustrated him when he heard about some youngsters turning up late for training even though many of them are ferried to and from Kirkby by taxis on club accounts. Punctuality steadily improved after that. There is understandable scepticism that Gerrard is going to a carcass of a club where nothing is ever as it seems, that he will have to learn quickly where the ice is thin – if it is not thin everywhere already. Gerrard’s challenge increases now because he is dealing with transfers, a different media and fans who respect his achievements elsewhere but do not automatically worship him for what he represents. Had Klopp’s job been available, Gerrard would have been amongst the contenders to replace him, despite management inexperience.